If you are buying a home these days you should probably do your due diligence on dangerous intersections that are within a few blocks of your home. Especially if you have kids and these kids like to play outside and walk to school or around the neighborhood. Common sense would tell you that your local government should provide a map of these hazardous intersections and provide this data to Google Maps and other navigation sources. Does this happen? Off course it doesn't!!! One of the biggest concerns of a prospective home buyer today is the safety of street and neighborhood. What kind of traffic on the street next to the home and is it safe to walk the streets and have my kids play outside. Most people don't often think of doing due diligence on historic accidents in the neighborhood or street. We have even done a map showing dangerous schools near hazardous intersections. Most drivers are much more more distracted than they were 20 years ago and thus accidents and pedestrian fatalities have increase significantly. Here is an article about the top reasons that cause a dangerous intersection and another article about the top 10 causes of death among people ages 15-29. It is not always transparent if you are new to a neighborhood if there have been historic problems with a particular intersection and its not easy to find news articles and get information. In fact, not all cities keep historic accident records and are required to publish the information for fear of liability. Public relations is a huge part of trying to squash any negative press about intersections that are "dangerous by design" because cities don't want the liability or lawsuit. Cities don't have fix problems unless they are forced to fix the issue with enough pressure. Here is a person in Redondo Beach that won a lawsuit against the city for $27M because he proved the intersection was dangerous by design and the city did nothing to fix the problem. 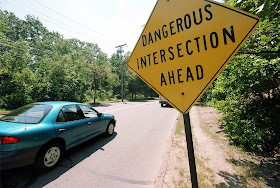 BadIntersections.com uses public news data sources and user contributions to map dangerous vehicle, pedestrian, bike and train intersections. We collect thousands of new fatalities and articles from around the World highlighting dangerous intersections. The map is free to search and can be found by clicking on the map below. If you see an intersection area that you would like us to add please email us an article or click on the + directly on the map to contribute the location. Keep in mind we do not accept all submissions unless the information is complete with substantiated evidence. We often get emails from real estate agents looking for data to help their clients better understand what dangerous intersections exists in the neighborhood near the home. This is often true of out of state buyers looking at homes who are unfamiliar with the area. Home buyers from out of the area often want to get a feel for the area without having to see the location first hand and want to know if a particular home or apartment is near any hazards. Badintersectionscom is actively trying to dangerous intersection locations used by real estate companies like Zillow, RedFin, HomeSnap & Realtor.com. We think hazardous road location data should be an attribute used by real estate companies similar to how Walkscore provides a information about things nearby a home like schools, restaurants and parks.